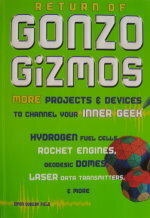 A fuel cell is a device that converts a fuel such as hydrogen, alcohol, gasoline, or methane into electricity directly. A hydrogen fuel cell produces electricity without any pollution, since pure water is the only byproduct. Hydrogen fuel cells are used in spacecraft and other high-tech applications where a clean, efficient power source is needed. 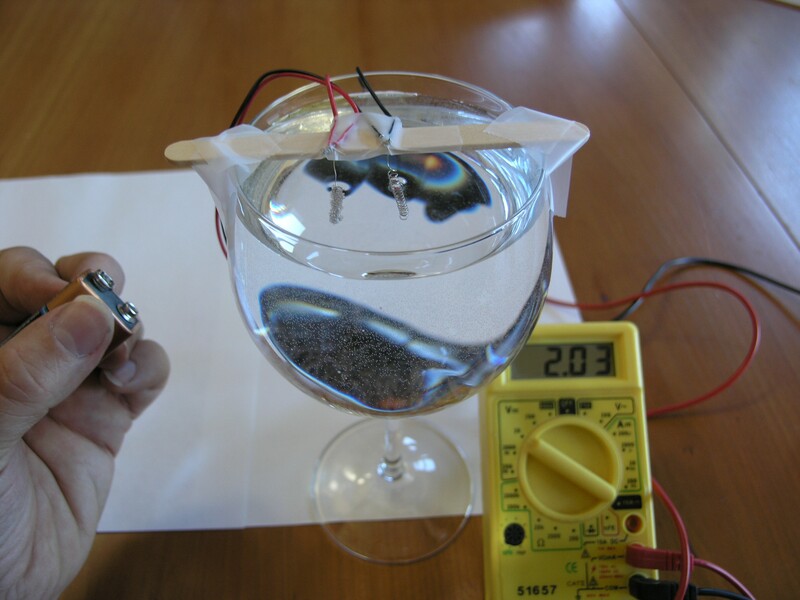 You can make a hydrogen fuel cell in your kitchen in about 10 minutes, and demonstrate how hydrogen and oxygen can combine to produce clean electrical power. One foot of platinum coated nickel wire, or pure platinum wire. Since this is not a common household item, we carry platinum coated nickel wire in our catalog. A popsickle stick or similar small piece of wood or plastic. A 9 volt battery clip. The first step is to cut the platinum coated wire into two six inch long pieces, and wind each piece into a little coiled spring that will be the electrodes in our fuel cell. 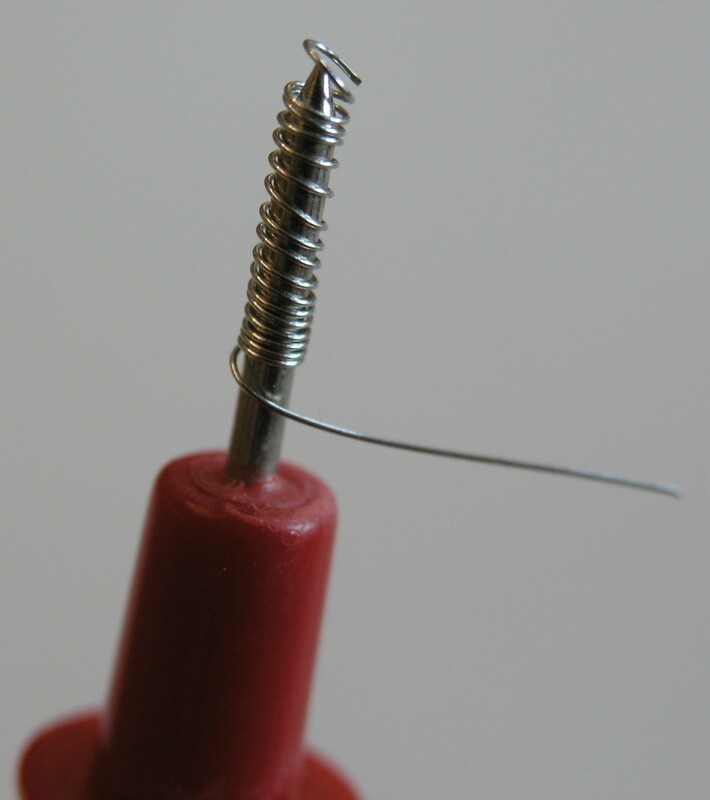 I wound mine on the end of the test lead of my volt meter, but a nail, an ice pick, or a coat hanger will do nicely as a coil form. Next, we cut the leads of the battery clip in half and strip the insulation off of the cut ends. Then we twist the bare wires onto the ends of the platinum coated electrodes, as shown in the photo. 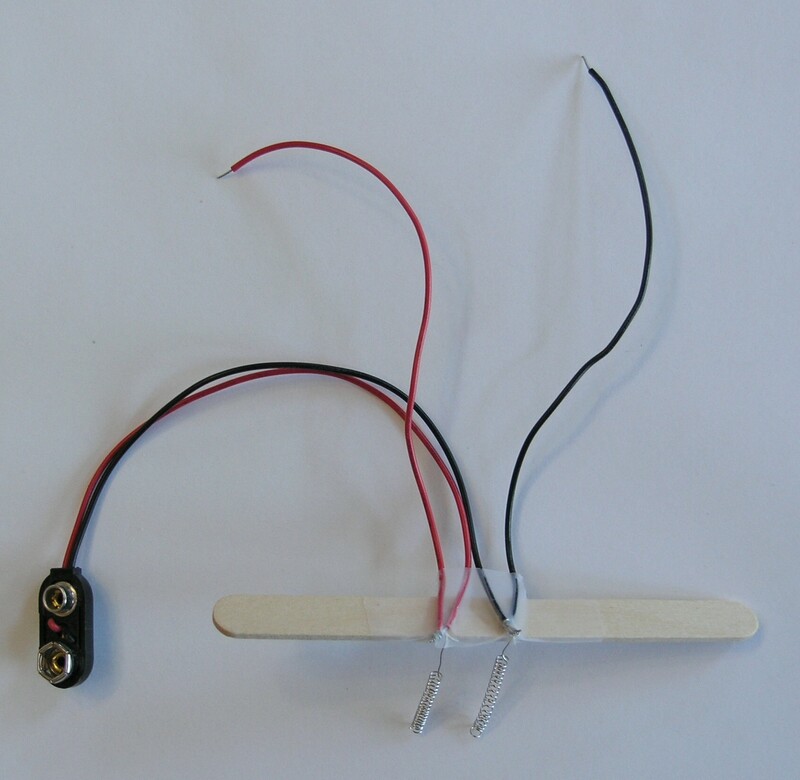 The battery clip will be attached to the electrodes, and two wires will also be attached to the electrodes, and will later be used to connect to the volt meter. The electrodes are then taped securely to the popsickle stick. 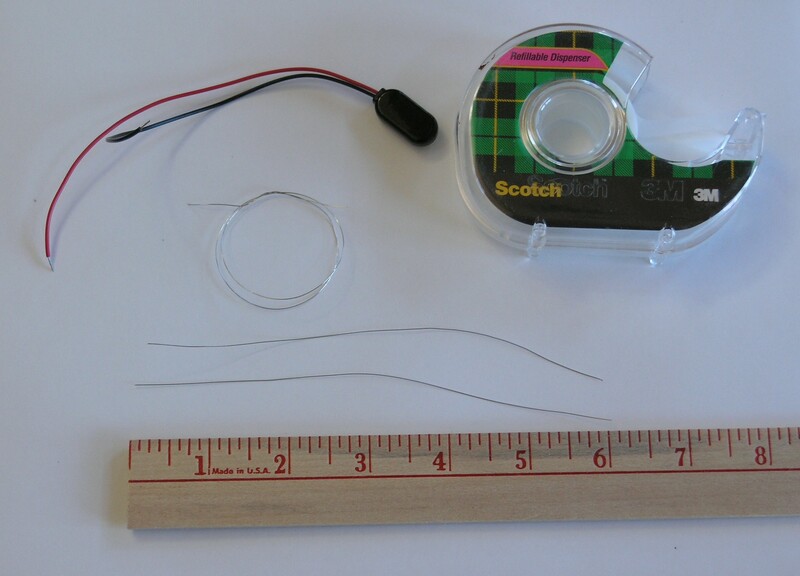 Lastly, the popsickle stick is taped securely to the glass of water, so that the electrodes dangle in the water for nearly their entire length. The twisted wire connections must stay out of the water, so only the platinum coated electrodes are in the water. Now connect the red wire to the positive terminal of the volt meter, and the black wire to the negative (or "common") terminal of the volt meter. The volt meter should read 0 volts at this point, although a tiny amount of voltage may show up, such as 0.01 volts. Your fuel cell is now complete. To operate the fuel cell, we need to cause bubbles of hydrogen to cling to one electrode, and bubbles of oxygen to cling to the other. There is a very simple way to do this. We touch the 9 volt battery to the battery clip (we don't need to actually clip it on, since it will only be needed for a second or two). 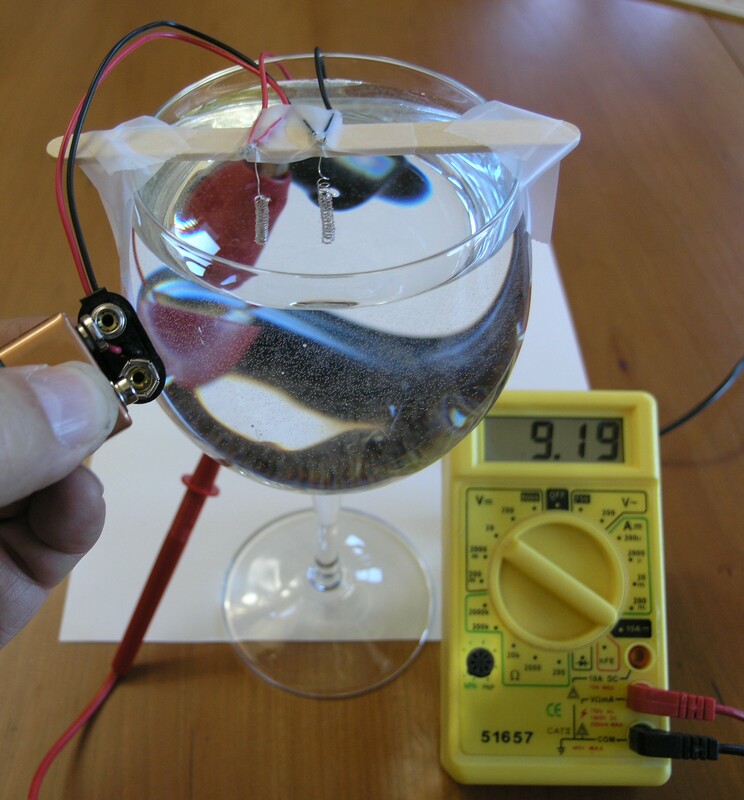 Touching the battery to the clip causes the water at the electrodes to split into hydrogen and oxygen, a process called electrolysis. You can see the bubbles form at the electrodes while the battery is attached. Now we remove the battery. If we were not using platinum coated wire, we would expect to see the volt meter read zero volts again, since there is no battery connected. 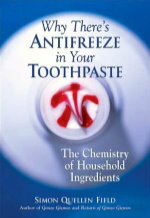 The platinum acts as a catalyst, allowing the hydrogen and oxygen to recombine. The hydrolysis reaction reverses. Instead of putting electricity into the cell to split the water, hydrogen and oxygen combine to make water again, and produce electricity. After a minute or so, the voltage declines much more slowly, as most of the decline is now due only to the gasses being used up in the reaction that produces the electricity. Notice that we are storing the energy from the 9 volt battery as hydrogen and oxygen bubbles. We could instead bubble hydrogen and oxygen from some other source over the electrodes, and still get electricity. Or we could produce hydrogen and oxygen during the day from solar power, and store the gasses, then use them in the fuel cell at night. We could also store the gasses in high pressure tanks in an electric car, and generate the electricity the car needs from a fuel cell. We have two things going on in this project — the electrolysis of water into hydrogen and oxygen gasses, and the recombining of the gasses to produce electricity. We will look into each step separately. 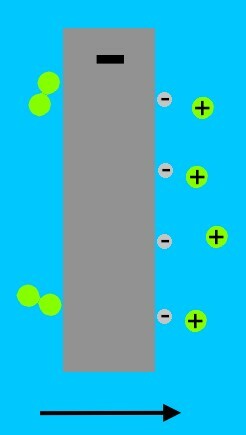 The electrode connected to the negative side of the battery has electrons that are being pushed by the battery. Four of the electrons in that electrode combine with four water molecules. The four water molecules each give up a hydrogen atom, to form two molecules of hydrogen (H2), leaving four negatively charged ions of OH-. 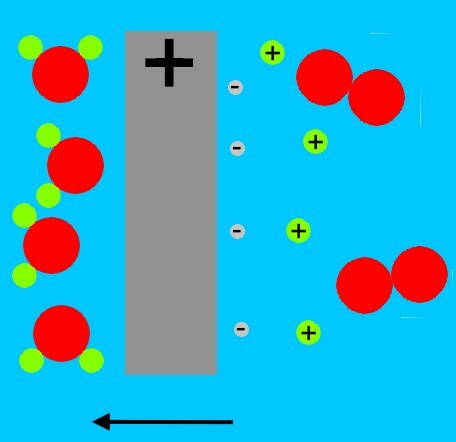 The hydrogen gas bubbles up from the electrode, and the negatively charged migrate away from the negatively charged electrode. 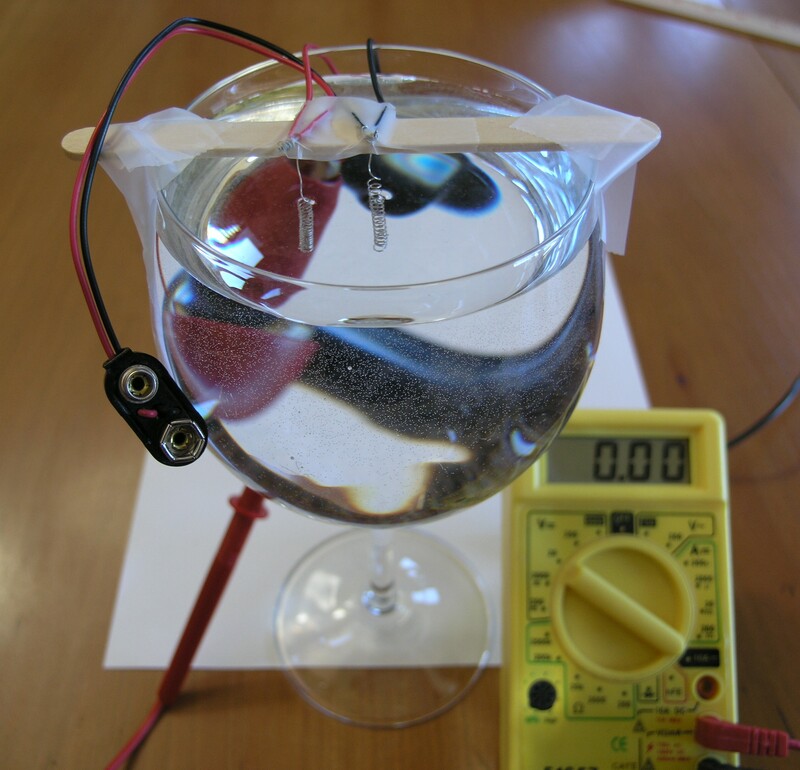 At the other electrode, the positive side of the battery pulls electrons from the water molecules. The water molecules split into positively charged hydrogen atoms (single protons), and oxygen molecules. 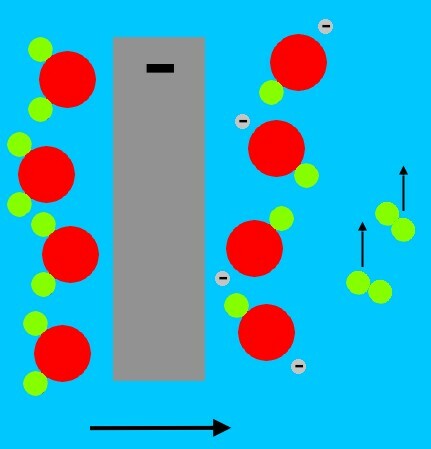 The oxygen molecules bubble up, and the protons migrate away from the positively charged electrode. The protons eventually combine with the OH- ions from the negative electrode, and form water molecules again. When we remove the battery, the hydrogen molecules that are clinging as bubbles to the electrode, break up due to the catalytic action of the platinum, forming positively charged hydrogen ions (H+, or protons), and electrons. 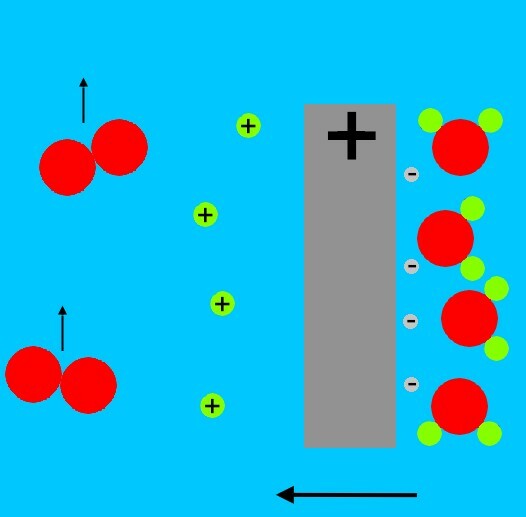 At the other electrode, the oxygen molecules stuck in bubbles on the platinum surface draw electrons from the metal, and then combine with the hydrogen ions in the water (from the reaction at the other electrode) to form water. The oxygen electrode has lost two electrons to each oxygen molecule. The hydrogen electrode has gained two electrons from each hydrogen molecule. The electrons at the hydrogen electrode are attracted to the positively charged oxygen electrode. 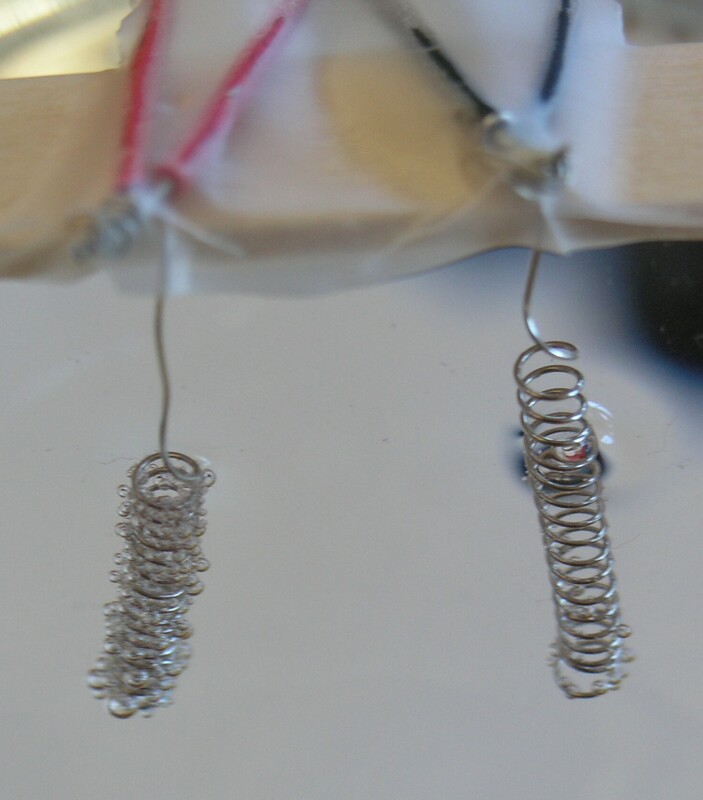 Electrons travel more easily in metal than in water, so the current flows in the wire, instead of the water. 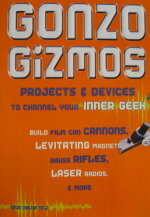 In the wire, the current can do work, such as lighting a bulb, or moving a meter.